A reader recently sent us an article published on Arch Daily called, "Studio Gang Breaks Ground on Ecologically Diverse Urban Mecca". 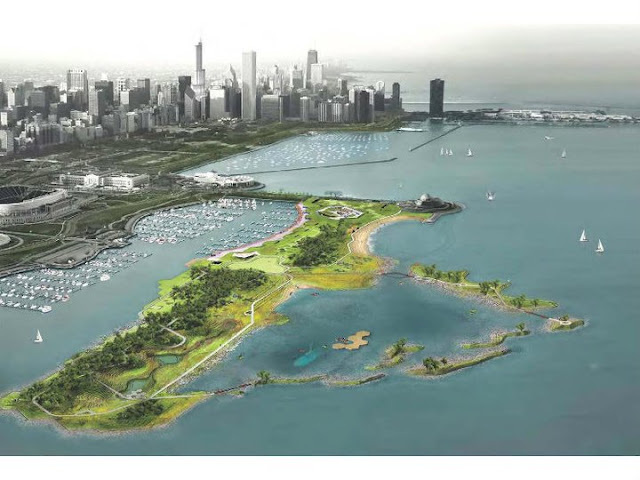 This is in reference to their plans for Northerly Island. While the Arch Daily article didn't provide any new information as far as we can tell, it did spark some additional curiosity on our end and as a result we did some more reading. After all it's February in Chicago and we need to fantasize about warmer weather activities. Just leave it alone and hire more cops. What a disgraceful and needless waste of money, ditto the cutting down of trees to "improve" northeast Grant Park. don't count on this project ever happening guys. if you know the history of northerly island you'll understand why. ran out of money the first time so there is only one 'island', the most northerly. if chicago wants to build this they will have to completely eliminate city employees pensions to pay for it. can you imagine the unions marching the street in riots if that ever happened. In addition, to boat this area between between the planetarium and entrance to burnham harbor, it is extremely violent due to the idiotic sea wall that chicago built up along the shoreline. This would make it even worse for boaters.